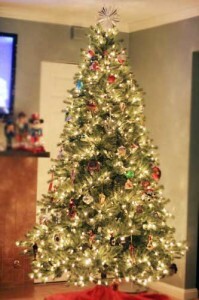 Read my 2012 Costco Christmas Tree update now. 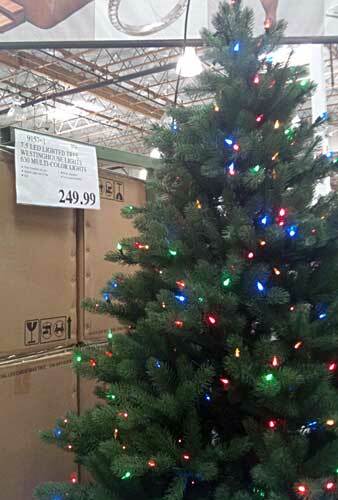 Costco carries a variety of Christmas trees in stores. There are pre-lit artifical Christmas trees, as well as real fresh-cut trees. Unfortunately not very many stores carry the real trees, which is a bummer because they are a great deal. For the artifical, they carry 7.5 ft and 9.5 ft with white lights as well as 7.5 ft in color lights. These 7.5′ white GE made trees include a foot pedal switch, 1,000 lights, tree stand, Constant ON lights, and are Colorado Spruce priced at $250. The 9.5′ is similar, with more lights. The 7.5′ multi-color artificial pre-lit also has a price of $250, but is made by Westinghouse, has only 630 lights, is LED, and also has a stand. I will give my review of the 2011 7.5′ white Costco pre lit christmas tree. Most importantly, we are very happy with our purchase. My favorite part was how easy it was to set up. From the time I opened the box it was completely up in 3 minutes. The branches were already fluffed and connected, the lights were on it and the stand was easy. I connected the top, middle, and bottom and plugged it in and I was done. With past artificial trees I’ve had to sort all the branches by letter (size), connect them one by one, and then string lights. An hour and a half later I was done, instead of three minutes it took with this one. And on top of all of that, this tree looks much better and more realistic. While we wish it had LED lights, we still think it is worth every penny spent. Costco carries fresh cut trees at select locations. In the Bay Area region they ship them in from Oregon. At our local Costco they arrived on Dec. 1st, and sold out within a week. 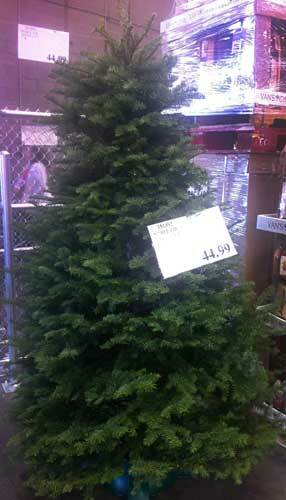 The price was $45 for a 7′ – 8′ noble fir. I’m sure tree prices vary across the country, but in the Bay Area trees like these would normally sell for $70 to $80. As you can see by the photo, it’s a beautiful tree as well. Our local location had 1,000 trees trailered in, and as I mentioned earlier, they sold out quick. You can pay for the tree at the register, drive your car to the trailer, show them the receipt and they’ll load it and tie it on to your car for you. They claim the tree was cut down within the last week. One downfall is that you can’t really see what the tree looks like until you take it home, unlike a tree lot. I suppose that’s where Costco’s excellent return policy comes in handy. You can have it opened once you buy though, it just makes it harder to take home once opened. 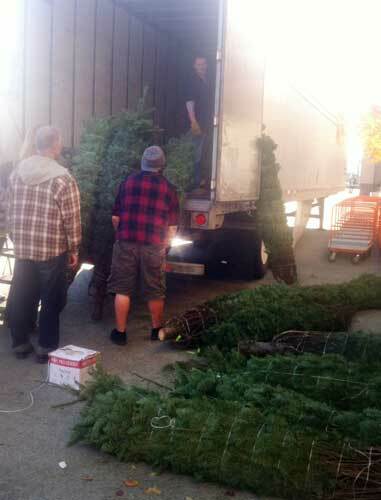 Did you get a Costco Christmas tree? What do you think? We purchased a live 7-8 ft. Fraser fir tree at our local Costco on December 4, 2011. The tree seemed fine until this morning, December 18, when it began shedding live ticks all over our floor. We had to un-trim the tree and remove it from the house immediately to thoroughly clean. I called Costco about it, and they told me they would honor the return (without having to haul the tree back to the store with the ticks!) I was thankful for that. This was unfortunate, as we had purchased a live tree last year from Costco and were so pleased with it. Now we are debating if we should buy an artificial tree, or another live tree. With only one week until Christmas, this is is not easy and even more difficult to fit into our busy schedules. Never had to trim a tree twice in one season! We purchased a live 7-8 ft. Fraser fir tree at our local Costco in early December. The tree was wrapped so I couldn’t see what it looked like but when we unwrapped it and set it in the stand it was beautiful. The tree was full and well shaped. It was easy to decorate and stayed fresh until I took it down today. There were a minimum of needles. This is the best fresh tree we’ve had in years and I will buy our tree from Costco next year. I would have liked it a little taller but shorter is easier to decorate. I purchased the 7.5′ pre-lit tree with 1000 white lights from Costco in November 2010. I was called shortly afterwards to notify me of a problem with some of the light strands not working properly. I had no problems with my tree in Dec. 2010, however, during the 2011 Christmas season, light strands in 2 of the 3 tree sections went out. I attempted to call the hotline of the manufacturer to rectify this situation and all they wanted to do was send me new light strands to rewrap myself. Costco’s letter about the problem stated that new tree sections would be sent to replace those that the lights had gone out on. The customer service rep for the manufacturer insisted that was only the guarantee for 2010. Needless to say I was very upset about buying a pre-lit tree to save the hassle of stringing lights myself only to find out I am going to have to do this after only 1 Christmas Season of use! I called Costco about the tree after getting nowhere with the manufacturer and the customer service rep told me to bring the tree back for a full refund. There was no hassle with customer service at all. I just want to say I am very impressed with the way Costco handled my return with absolutely no hassle! This is the second time I have had to return something to Costco a year after the original purchase! Costco’s guarantee really is the best! Thank you Costco! I got a fresh cut tree from San Juan Capistrano,CA and love our tree. Very fresh and perfect. We bought an artificial 7.5 pre-lit christmas tree from Costco and love it. We just put it up and discovered that one of the three strings of lights on the top section is not working. We’ve tried replacing all of the bulbs in that string, but nothing happened. I saw in the instructions that there are places where we can replace fuses, but I cannot locate those places. Does anyone know where I can locate them on the tree? I think they are in the plugs, BUT fuses are rarely the problem. I also have a 7.5 pre-lit Costco tree with the same problem as yours. I fixed it today easily by buying a Light Keeper Pro from Lowe’s (about $20) – check this on Google or Amazon. This device is only for incandescent bulbs, not LED. There is a different device for LED. My problem now is I can’t find any replacement bulbs that fit. My bulbs are a bit larger than those being made now, and the new ones don’t fit snuggly into the bases from my tree. I require the GE Constant On 2.5 volt, 0.2AMPS type. My tree is only a few years old!